Fs2002 boeing 737-800 ei-dao ryanair pride of scotland.. A repaint of the ffx boeing 737-800 in the new colours. Of ryanair with the added pride of scotland. Titles carried by this aircraft.. 32 bit textures, alpha channel for realistic. Reflections, no mipmaps. Textures repaint by gerry mclaughlin. 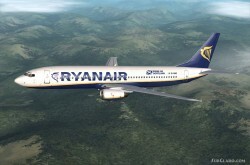 FS2002 boeing 737-800 ei-dao ryanair pride scotland.. Rating: 7.67 of 10 over a total of 3 reviews.